Wisconsin Governor Scott Walker (AP Photo/Morry Gash, File). Wisconsin Governor Scott Walker is perhaps best known for dramatically weakening public and private unions in his state—something that has propelled him to the top of the 2016 Republican presidential field. Over Walker’s long career in state politics, he also accomplished another transformation: increasing Wisconsin’s incarceration rate while making sure private companies had a larger role managing those prisoners. He rarely talks about it anymore, but Walker’s efforts as a young legislator didn’t just change the Wisconsin criminal justice system—they helped fill Walker’s campaign coffers with money from private prison operators as he ascended from the state legislature to the governor’s mansion. Walker pushed dozens of proposals in the state house to lengthen criminal penalties, for everything from perjury to privacy invasion to intoxicated boating. In just the 1997–98 legislative session, Walker authored or co-sponsored twenty-seven different bills that either expanded the definition of crimes, increased mandatory minimums for offenders, or curbed the possibility of parole. Walker’s biggest victory in this area was the state’s “Truth-in-Sentencing” legislation, which ended parole opportunities for many categories of prisoners, and increased prison time for others. “The time has come to keep violent criminals in prison for their full terms,” Walker said in 1996 as he advocated for the bill. Later, as chair of the state assembly’s Committee on Corrections and the Courts in 1998, Walker shepherded the legislation into state law. While Walker advocated imprisoning more people, he was also paradoxically decrying overpopulation in Wisconsin’s prisons. “Massive overcrowding threatens our public safety,” Walker announced in a press release less than a month after Truth-in-Sentencing was passed. Indeed, by the early 2000s, there were more than 20,000 prisoners in a prison system originally designed for 10,000. Walker conceded that his bills imposing harsher sentences exacerbated the problem. “Criminals will be spending more time in jail, and that means the population will increase as well,” he told the Wauwatosa News-Times. His solution wasn’t to stop imprisoning nonviolent offenders, however, but to put them in private prisons. Walker, like many state legislators during this time, argued that private prisons cost less yet deliver the same quality as their public counterparts. Decades of research, however, have shown the opposite to be true: across the country, private prisons have been plagued by lax security, falsifying records to cover up understaffing, rampant prisoner mistreatment, and in many cases actually cost taxpayers more money than public prisons. Private prisons also have a clear incentive to increase prison populations—in fact, most private prisons demand a “lockup quota” whereby the state guarantees that most private prison beds will be filled (or would pay for unused beds if crime rates dip). The quota is typically 90 percent, though in some instances can be as high as 100 percent. Walker still wanted private prisons to play a big role in Wisconsin. But the tricky part was that Wisconsin laws forbid private prisons inside the state. So Walker found a pretty good work-around. In 1997, he voted to allow the Wisconsin Department of Corrections to ship inmates to private prisons in other states. This built off legislation Walker co-sponsored in 1995 that first allowed Wisconsin to ship inmates off to public prisons elsewhere. Following the bill’s passage, when the DOC formally proposed a contract in 1998 to ship inmates to out-of-state private prisons, Walker was a vocal advocate, boasting online about his work on the matter. “This plan keeps inmates locked up and it saves taxpayers money,” Walker said. Throughout 1990s and early 2000s, with Walker at the helm of the assembly’s Committee on Corrections and the Courts, Wisconsin shipped around 5,000 inmates to Oklahoma, Tennessee, and Minnesota. Most of the prisoners, along with almost $45 million in Wisconsin taxpayer money, went to private prisons operated by one company: the Corrections Corporation of America. CCA is the largest private prison operator in the country, running more than sixty prisons with over 90,000 beds across the country, and generating $1.7 billion in revenue. It’s the biggest player in a private prison industry in the United States that has spent $45 million in the last decade on political contributions and lobbyists. In states across the country, the private prison industry was pushing legislatures to send more prisoners its way, and this was certainly the case in Wisconsin. When ALEC was providing the text for the Truth-in-Sentencing, CCA was a corporate member of the group. (It left ALEC in 2010). CCA was also a major contributor to Scott Walker’s political career. During Walker’s decade in the State Assembly, just fifteen people gave the maximum contribution to his campaigns. Two worked for CCA, including then-CEO Doc Crants and then-board member Henri Wedell, who owns $25 million in CCA stock. Both men live in Tennessee, not Wisconsin. 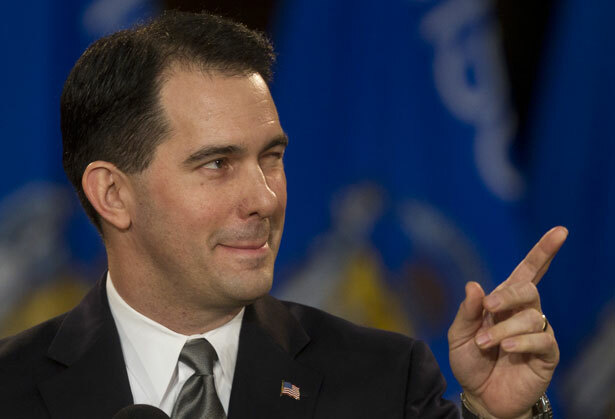 Over the course of Walker’s political career, CCA executives have contributed more than $7,500 to his campaigns. After Truth-in-Sentencing passed and Wisconsin began alleviating its overcrowded prisons by shipping inmates to out-of-state prisons run by CCA, Walker still wanted to open private prisons in Wisconsin. “We are sending thousands of inmates to public and private facilities in other states,” Walker said in December 1998. “It only makes sense that we allow a private firm to build and operate an accredited facility in our own state. The jobs and taxes that come from a prison should stay in our own state.” In the following legislative session, he proposed at least three separate bills to privatize prisons in the state. Each one failed, in part because labor unions opposed them. Democrats, who controlled the state Senate, also opposed the prison privatization bills, and even fellow Republican and then-Governor Tommy Thompson didn’t approve of Walker’s plan. In the meantime, Walker still did his best to ensure the flow of Wisconsin inmates to out-of-state prisons. For instance, he proposed delaying the opening of a new public prison—despite his earlier outrage about overcrowding in state prisons—in order to prevent the return of Wisconsin inmates from out-of-state private prisons. In recent years, Wisconsin has sent fewer and fewer inmates to out of state prisons as the overall incarceration rate dropped, though it retains the legal ability to ship inmates out. In 2002, Walker left the State Assembly after getting elected Milwaukee county executive, but his affinity for private prisons continued. Though he was no longer in a position to legalize them in Wisconsin, there were still favors that could be doled out to companies like CCA. In 2007, for example, Walker’s budget proposal included an initiative to privatize the county’s prison transport service. According to the Milwaukee Journal Sentinel, “Walker’s budget lists a $1.5 million cost to hire TransCor for the last 10 months of 2008.” TransCor is a wholly owned subsidiary of CCA. The county’s finance committee unanimously rejected Walker’s prison transport plan. Despite his significant achievements in pushing more incarceration and more privatization of prison services in Wisconsin—surely among the top achievements of his early career—Walker never boasts about it these days. In fact, by 2010, Walker disavowed his earlier support for private prisons. “We’re not going to outsource correctional officers…because that’s obviously a vital public safety issue that should be done by public sector employees,” he said during a radio interview, sounding markedly different from state representative Walker. When the host pressed him on his past support for privatization, Walker said it was simply a “safety issue” due to prison overcrowding. He did not mention his legislation increasing prison sentences, his opposition to new public prisons or the contributions he received from executives at CCA. Scott KeyesScott Keyes is a freelance writer based in Denver, Colorado. His work can be found in the Washington Post, the Atlantic, ThinkProgress, and the Guardian.